The Longitudinal Valley fault (LVF) runs parallel to the East coast of Taiwan and is one of the major active faults accommodating the present day 9 cm/yr convergence rate between the Eurasian and the Philippine Sea Plate (Figure 1a). South of Taiwan this convergence is absorbed along the Manila trench by the eastward subduction of the oceanic crust of the South China Sea beneath the Philippine Sea Plate, leading to the creation of the Luzon volcanic arc (zone I in Figure 1). In Taiwan, the continental shelf of South China has now entered the subduction, resulting in a collisional orogeny, at the origin of the formation of the Taiwan Island. The Henchung Peninsula, at the southern tip of Taiwan, represents the exhumed accretionary prism. North of 21°'N, the North Luzon arc collided obliquely with Eurasian continent. The collision has resulted in deformation of the western part of the North Luzon Trough (forearc basin), creating the Huatung Ridge with backthrusting eastward. The Luzon arc and the forearc basin have ultimately been accreted onto eastern Taiwan over the last 5 Ma forming the Coastal Range. As the collision developed, the deformation of the continental passive margin of the South China Sea led to the exhumation of its metamorphic basement, forming the core of the Central Range (Figure 1). The Longitudinal Valley Fault marks the western border of the Coastal Range and is generally interpreted to form the suture zone between the continental margin of South China and the Luzon arc. Figure 2 Geological map of eastern Taiwan (Thomas et al., 2014c), modified from Wang and Chen, (1993). The Coastal Range is composed of three accreted Mio-Pliocene volcanic islands (Tuluanshan formation), three remnants of Plio-Plesitocene forearc basins and intra-arc basins (Fanhsuliao, Paliwan and Shuilien conglomerates), and the Pliocene collision Lichi Mélange, which is related to the suturing of the subduction zone due to the collision between the Luzon arc and the continental margin of South China (Figure 1). Peinanshan and the Wuho are post-collision conglomerates. Central Range formations that border the Longitudinal Valley, include slates and schist. The expanding set of seismic and geodetic observations provides increasingly better insight into the variability of fault slip behaviors over a wide range of temporal and spatial scales (slip rate from mm/yr to m/s) : fault slip can be either aseismic or seismic. These observations suggest a complex pattern of slip, with a fault interface likely consisting of interfingered patches that either creep at a low rate, without seismic radiation, or remain locked during the interseismic period and rupture seismically. It has been observed that this segmentation has a strong influence on seismic rupture pattern: locked segments may rupture independently or together with neighboring patches, producing irregular earthquakes of different sizes. What controls the mode of slip is an important issue in seismotectonics, since the seismic potential of any fault strongly depends on the partitioning between seismic and aseismic slip. However, how this partitioning varies in time and space and what are the factors governing this behavior (such as temperature, lithology and pore fluids) remain poorly understood questions. Geodetic techniques, combined with seismology, provide the tools to quantify slip mode. Here we focus on the spatiotemporal evolution of slip on the Longitudinal Valley Fault (Figure 1). Figure 3. Interseismic coupling (ISC) distribution (Thomas et al., 2014b). ISC quantifies the degrees of locking of the LVF fault. If ISC = 1, then the fault patch is fully locked, whereas ISC = 0 means that the patch is creeping at the long-term slip rate. Black, green, and blue stars indicate the epicenter of the 2003 Chengkung earthquake, the 1938 earthquake, and the 1951 earthquakes sequence, respectively. Black curves show contour lines of coseismic slip distribution for the 2003 Mw 6.8 Chengkung Earthquake. Deformation of anthropogenic features shows that aseismic creep accounts for a significant fraction of fault slip near the surface, whereas a fraction of the slip is also seismic, since this fault has produced large earthquakes with five Mw > 6.8 events in 1951 and 2003. In this study, we analyze a dense set of geodetic and seismological data around the LVF, including campaign mode GPS measurements, time series of daily solutions for continuous GPS stations (cGPS), leveling data, and accelerometric records of the 2003 Chenkung earthquake. To enhance the spatial resolution provided by these data, we complement them with interferometric synthetic apertureradar (InSAR) measurements produced from a series of ALOS images processed using a persistent scatterer technique. The combined data set covers the entire LVF and spans the period from 1992 to 2010. We invert conjointly these data to infer the temporal evolution of fault slip at depth using the Principal Component Analysis-based Inversion Method. This technique allows the to take advantage of the spatial resolution given by the InSAR measurements and the temporal resolution afforded by the cGPS data. (3) that aseismic afterslip occurred around the area that ruptured seismically. We find consistency between geodetic and seismological constraints on the partitioning between seismic and aseismic creep. About 80–90% of slip on the southern section of LVF in the 0–26 km, seismogenic depth range, is actually aseismic. We infer that the clay-rich Lichi Mélange is the key factor promoting aseismic creep at shallow depth (see following section). M. Y. Thomas, J.-P. Avouac, J. Champenois, J.-C. Lee, and L.-C. Kuo, 2014. 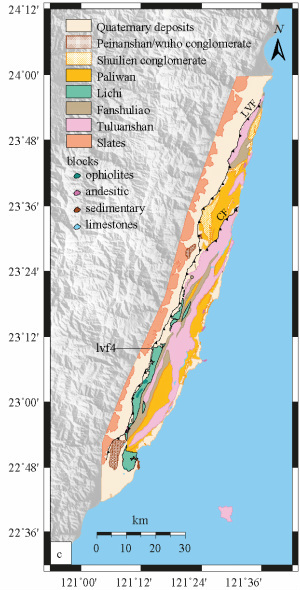 Spatiotemporal evolution of seismic and aseismic slip on the Longitudinal Valley Fault, Taiwan, Journal of Geophysical Research-solid Earth, v. 119, online (26p). How we underlined in the previous section, geodetic and seismological observations show that fault slip can be either seismic or aseismic. The observations that locked fault patches tend to coincide with seismic ruptures, combined with numerical studies, suggest that the partitioning between aseismic and seismic slip is an influential and perhaps determining factor governing the spatial extent, size and timing of earthquake ruptures. However, the factors that determine the mode of fault slip, and hence the seismogenic potential of faults, are still poorly understood. Understanding the deformation mechanisms and their relative importance are therefore major goals in seismotectonics. In this study, we propose to address this problem by investigating the deformation mechanisms that control aseismic slip on the Longitudinal Valley Fault (LVF) in Taiwan. Figure 4. Electron probe micro-analyzer compositional maps of Lichi sample lvf4, displaying a microlithon enmeshed in foliated matrix. Sample lvf4 was collected in the field, inside the LVF fault gouge. For location of the analysis, see Figure 2. Red, blue and white colors indicates high, intermediate and missing contents respectively. The distribution of aluminum indicates pervasive claymineralization of the foliated matrix. The foliated gouge is also clearly depleted in Si, Ca and Na and passively concentrated in K, Al, Fe,Mg, Ti, and S compared to the microlithon (initial state), showing a deficit in soluble minerals that is likely related to pressure-solution diffusive mass transfer. The top-right corner figure is the corresponding BSE image of the area. The Longitudinal Valley Fault (LVF) in Taiwan is creeping at shallow depth along its southern half, where it is bounded by the Lichi Mélange. By contrast, the northern segment of the LVF is locked where it is bounded by forearc sedimentary and volcanoclastic formations. The objective of this study is to investigate the potential factors that favor aseismic slip on the LVF based on structural and microstructural analysis of the various formations along the LVF and of rocks from the fault zone. The study is based on field investigations and analysis of samples collected at the outcrops and from drill cores. We find that the Lichi Mélange most probably formed as a result of internal deformation of the forearc when the continental shelf of South China collided with the Luzon arc as a result of the subduction of the South China Sea beneath the Philippine Sea Plate. The forearc formations constitute the protolith of the Lichi Mélange. It seems improbable that the mechanical properties of the minerals of the matrix (illite, chorite, kaolinite) in themselves explain the aseismic behavior of the LVF. Microstructural investigations show that deformation within the fault zone must have resulted from a combination of frictional sliding at grain boundaries, cataclasis (responsible for grain size comminution) and pressure solution creep (responsible for the development of the scaly foliation and favored by the mixing of soluble and insoluble minerals). The microstructure of the gouge formed in the Lichi Mélange favors effective pressure solution creep, which inhibits strain-weakening brittle mechanisms and is probably responsible for the dominantly aseismic mode of fault slip. 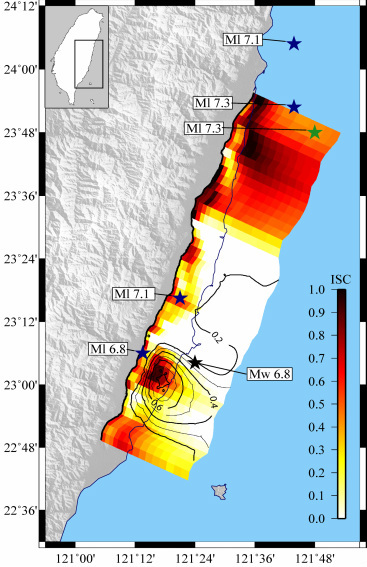 Since the Lichi Mélange is analogous to any unlithified subduction mélanges, this study sheds light on the mechanisms which favor aseismic creep on subduction megathrust. M. Y. Thomas, J.-P. Avouac, J.-P. Gratier, and J.-C. Lee, 2014. Lithological control on the deformation mechanism and the mode of fault slip on the Longitudinal Valley Fault, Taiwan, Tectonophysics, in press (16p.). Understanding the partitioning between seismic and aseismic slip is an important issue in seismotectonics, since it is a key factor in determining the seismic potential of any fault. Theoretical and numerical techniques now exist to simulate fault slip and reproduce this partitioning. In such modeling, it is essential to incorporate all stages of the fault slip, including seismic as well as preseismic, postseismic, and interseismic slow slip, into a single physics-based model, as they interact and influence each other. Indeed, prestress inherited from aseismic slip history and prior seismic events likely determines where earthquakes will nucleate and how far their rupture will propagate. However, numerical simulations that account for full inertial (wave) effects during seismic events as well as long-term slow slip are computationally challenging because of the wide range of temporal and spatial scales involved. That is why the representation of inertial wave-mediated effects (and hence seismic radiation) is often simplified in most models of long-term fault slip. In particular, the quasi-dynamic (QD) approach approximately accounts for inertial effects through a radiation damping term. Figure 5 : Cumulative slip on the fault for the (a) FD and (b) QD simulations with the rate-and-state law and additional coseismic weakening. Red lines are plotted every 2 s during seismic events, while blue lines are plotted every 50 years. Black lines represent the cumulative slip after each seismic event. The FD and QD events are very different in size, recurrence, and propagation mode. The FD solution generates pulse-like events, while the QD formulation results in smaller events in the form of dying pulses and large crack-like events. 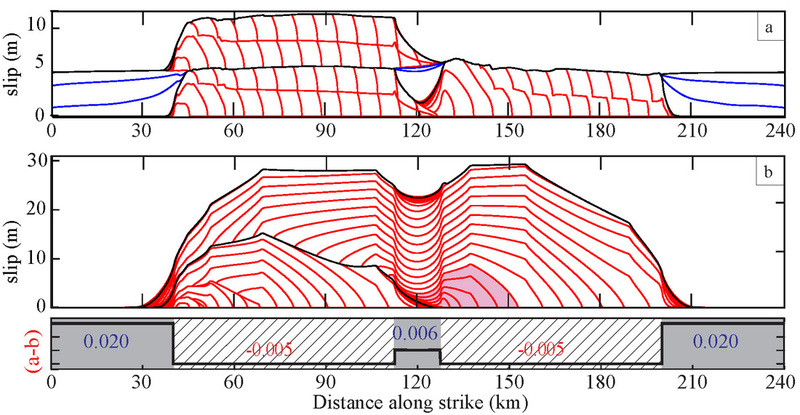 In this study, we compare QD and fully dynamic (FD) simulations by exploring the long-term behavior of rate-and-state fault models with and without additional weakening during seismic slip. The models incorporate a velocity-strengthening (VS) patch in a velocity-weakening (VW) zone, to consider rupture interaction with a slip-inhibiting heterogeneity. Without additional weakening, the QD and FD approaches generate qualitatively similar slip patterns with quantitative differences, such as slower slip velocities and rupture speeds during earthquakes and more propensity for rupture arrest at the VS patch in the QD cases. Simulations with additional coseismic weakening produce qualitatively different patterns of earthquakes, with near-periodic pulse-like events in the FD simulations and much larger crack-like events accompanied by smaller events in the QD simulations. This is because the FD simulations with additional weakening allow earthquake rupture to propagate at a much lower level of prestress than the QD simulations. The resulting much larger ruptures in the QD simulations are more likely to propagate through the VS patch, unlike for the cases with no additional weakening. Overall, the QD approach should be used with caution, as the QD simulation results could drastically differ from the true response of the physical model considered.